Alexandria Wildlife Control experts of Animal Control Solutions have been providing Wildlife Removal Services throughout the State of Virginia since 1993. We proudly provide services to Alexandria and surrounding areas. If you are experiencing a wildlife problem, rest assured, our experts of Animal Control Solutions have the experience and knowledge to resolve any wildlife situation that may arise at your home or business. Our experienced and knowledgeable staff can assist you in providing solutions to resolve Virginia’s wildlife conflicts. We are proud certified members of NWCOA, and permitted by the State of Virginia Inland and Fisheries to provide nuisance wildlife control services. Our Wildlife Control technicians attend national seminars on a yearly basis, allowing us to stay current with new technology and techniques specific to the Wildlife Control Industry. Animal Control Solutions are leaders in Wildlife Removal Services and Wildlife Control technology in the state of Virginia, we implement technology into the everyday trapping needs of the community, and work with homeowners and businesses to solve a multitude of animal problems while maintaining humane animal control techniques. 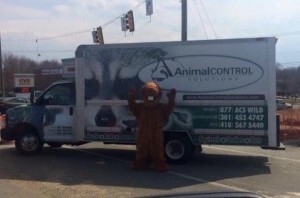 We proudly provide humane services to get rid of Virginia’s nuisance wildlife. We are humane wildlife company whose main goal is offer complete solutions to solve wildlife conflicts between our community and wild animals. We strongly pursue the approach of removing animals naturally without harm or stress placed on the animal.